Antikythera mechanism is an ancient Greek analogue computerand orrery used to predict astronomical positions and eclipses for calendrical and astrological purposes. Antikythera (/ˌæntᵻkᵻˈθiːrə/ ant-i-ki-theer-ə or /ˌæntᵻˈkɪθərə/ ant-i-kith-ə-rə) mechanism could also track the four-year cycle of athletic games which was similar, but not identical, to an Olympiad, the cycle of the ancient Olympic Games. Since Price’s assessment, modern X-ray and 3D mapping technology have allowed scientists to peer deeper into the remains of the mechanism and learn even more of its secrets. In the 2000s, researchers revealed text — a kind of instruction manual — inscribed on parts of the mechanism that had never been seen before. The text — written in tiny typeface but legible ancient Greek — helped them complete the puzzle of what the machine did and how it was operated. In all, it’s astounding. Found housed in a 340 millimetres (13 in) × 180 millimetres (7.1 in) × 90 millimetres (3.5 in) wooden box, the device is a complex clockwork mechanism composed of at least 30 meshing bronze gears. Using modern computer x-ray tomography and high resolution surface scanning, a team led by Mike Edmunds and Tony Freeth at Cardiff University peered inside fragments of the crust-encased mechanism and read the faintest inscriptions that once covered the outer casing of the machine. Detailed imaging of the mechanism suggests it dates back to 150-100 BC and had 37 gear wheels enabling it to follow the movements of the moon and the sun through the zodiac, predict eclipses and even recreate the irregular orbit of the moon. The motion, known as the first lunar anomaly, was developed by the astronomer Hipparchus of Rhodes in the 2nd century BC, and he may have been consulted in the machine’s construction, the scientists speculate. Its remains were found as one lump later separated in three main fragments, which are now divided into 82 separate fragments after conservation works. Four of these fragments contain gears, while inscriptions are found on many others. The largest gear is approximately 140 millimetres (5.5 in) in diameter and originally had 224 teeth. The artefact was recovered on May 17th 1901 from the Antikythera shipwreck off the Greek island of Antikythera, which in antiquity was known as Aigila. Believed to have been designed and constructed by Greek scientists, the instrument has been variously dated to about 87 BC, or between 150 and 100 BC, or in 205 BC, or within a generation before the date of the shipwreck (in about 150 BC). After the knowledge of this technology was lost at some point in antiquity, technological works approaching its complexity and workmanship did not appear again until the development of mechanical astronomical clocks in Europe in the fourteenth century. Discovery of The Antikythera Mechanism. The Antikythera mechanism was discovered in 45 metres (148 ft) of water in the Antikythera shipwreck off Point Glyphadia on the Greek island of Antikythera. The wreck was found in April 1900 by a group of Greek sponge divers, who retrieved numerous large artefacts, including bronze and marble statues, pottery, unique glassware, jewellery, coins, and the mechanism. All were transferred to the National Museum of Archaeology in Athens for storage and analysis. Merely a lump of corroded bronze and wood at the time, the mechanism went unnoticed for two years while museum staff worked on piecing together more obvious statues. The world’s first mechanical computer? To archeologists, it was immediately apparent that the mechanism was some sort of clock, calendar, or calculating device. But they had no idea what it was for. For decades, they debated: Was the Antikythera a toy model of the planets? Or perhaps it was an early astrolabe (a device to calculate latitude)? On 17 May 1902, archaeologist Valerios Stais found that one of the pieces of rock had a gear wheel embedded in it. Stais initially believed it was an astronomical clock, but most scholars considered the device to be prochronistic, too complex to have been constructed during the same period as the other pieces that had been discovered. Investigations into the object were dropped until British science historian and Yale University professor, Derek J. de Solla Price became interested in it in 1951. In 1971, both Price and Greek nuclear physicist Charalampos Karakalos made X-ray and gamma-ray images of the 82 fragments. Price published an extensive 70-page paper on their findings in 1974. It is not known how the mechanism came to be on the cargo ship, but it has been suggested that it was being taken from Rhodes to Rome, together with other looted treasure, to support a triumphal parade being staged by Julius Caesar. Generally referred to as the first known analogue computer, the quality and complexity of the mechanism’s manufacture suggests it has undiscovered predecessors made during the Hellenistic period. Its construction relied upon theories of astronomy and mathematics developed by Greek astronomers, and is estimated to have been created around the late second century BC. In 1974, Derek de Solla Price concluded from gear settings and inscriptions on the mechanism’s faces that it was made about 87 BC and lost only a few years later. Jacques Cousteau and associates visited the wreck in 1976 and recovered coins dated to between 76 and 67 BC. Though its advanced state of corrosion has made it impossible to perform an accurate compositional analysis, it is believed the device was made of a low-tin bronze alloy (of approximately 95% copper, 5% tin). All its instructions are written in Koine Greek, and the consensus among scholars is that the mechanism was made in the Greek-speaking world. In 2008, continued research by the Antikythera Mechanism Research Project suggested the concept for the mechanism may have originated in the colonies of Corinth, since they identified the calendar on the Metonic Spiral as coming from Corinth or one of its colonies in Northwest Greece or Sicily. Syracuse was a colony of Corinth and the home of Archimedes, which, so the Antikythera Mechanism Research project argued in 2008, might imply a connection with the school of Archimedes. However, it has recently been demonstrated that while the calendar on the Metonic Spiral belongs to Corinth or one of its colonies in Northwest Greece, it cannot be that of Syracuse. Another theory suggests that coins found by Jacques Cousteau in the 1970s at the wreck site date to the time of the device’s construction, and posits its origin may have been from the ancient Greek city of Pergamon, home of the Library of Pergamum. With its many scrolls of art and science, it was second in importance only to the Library of Alexandria during the Hellenistic period. The ship carrying the device also contained vases in the Rhodian style, leading to a hypothesis the device was constructed at an academy founded by the Stoic philosopher Posidonius on that Greek island. A busy trading port in antiquity, Rhodes was also a centre of astronomy and mechanical engineering, home to the astronomer Hipparchus, active from about 140 BC to 120 BC. That the mechanism uses Hipparchus’s theory for the motion of the moon suggests the possibility he may have designed, or at least worked on it. Finally, the Rhodian hypothesis gains further support by the recent decipherment of the relatively minor Halieia games of Rhodes on the Games dial. In addition, it has recently been argued that the astronomical events on the Parapegma of the Antikythera Mechanism work best for latitudes in the range of 33.3-37.0 degrees north; Rhodes is located between the latitudes of 35.5 and 36.25 degrees north. Cardiff University professor Michael Edmunds, who led a 2006 study of the mechanism, described the device as “just extraordinary, the only thing of its kind”, and said that its astronomy was “exactly right”. He regarded the Antikythera mechanism as “more valuable than the Mona Lisa”. In 2014, a study by Carman and Evans argued for a new dating of approximately 200 BC based on identifying the start-up date on the Saros Dial as the astronomical lunar month that began shortly after the new moon of 28 April 205 BC. Moreover, according to Carman and Evans, the Babylonian arithmetic style of prediction fits much better with the device’s predictive models than the traditional Greek trigonometric style. A study by Paul Iversen published in 2017 reasons, on the basis of newly deciphered games on the Games dial as the Halieia of Rhodes and the calendar on the Metonic Spiral being that of Epirus, that the prototype for the device was indeed from Rhodes, but that this particular model was modified for a client from Epirus, in northwestern Greece, and was probably constructed soon before, or within a generation of, the shipwreck. “Project overview” . The Antikythera Mechanism Research Project. Retrieved 1 July 2007. The Antikythera Mechanism is now understood to be dedicated to astronomical phenomena and operates as a complex mechanical ‘computer’ which tracks the cycles of the Solar System. Jump up ^ Swedin, Eric G.; Ferro, David L. (24 October 2007). Computers: The Life Story of a Technology . JHU Press. p. 1. ISBN 978-0-8018-8774-1. Retrieved 28 May 2013. It was a mechanical computer for calculating lunar, solar, and stellar calendars. Jump up ^ Paphitis, Nicholas (30 November 2006). “Experts: Fragments an Ancient Computer” . Washington Post. Imagine tossing a top-notch laptop into the sea, leaving scientists from a foreign culture to scratch their heads over its corroded remains centuries later. A Roman shipmaster inadvertently did something just like it 2,000 years ago off southern Greece, experts said late Thursday. ^ Jump up to: a b c d e f g h i j k l m n o p q r s Freeth, Tony; Bitsakis, Yanis; Moussas, Xenophon; Seiradakis, John. H.; Tselikas, A.; Mangou, H.; Zafeiropoulou, M.; Hadland, R.; et al. (30 November 2006). 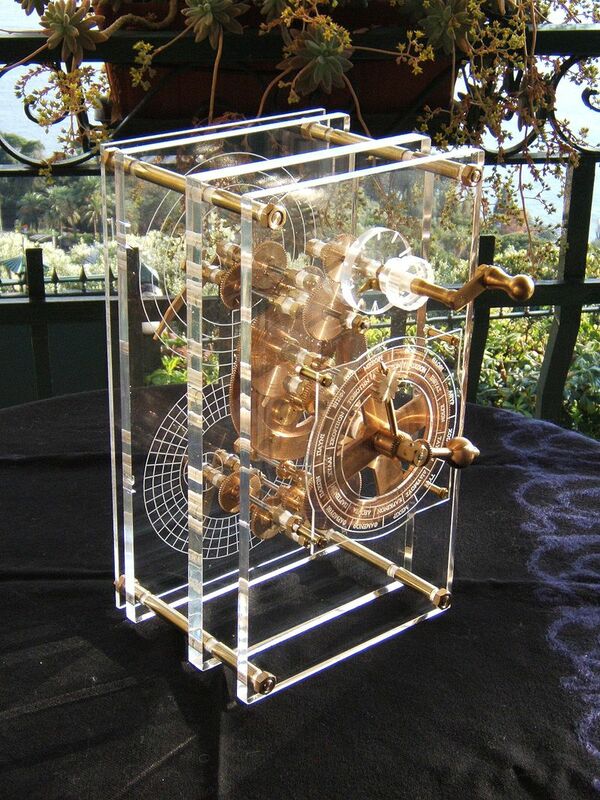 “Decoding the ancient Greek astronomical calculator known as the Antikythera Mechanism” (PDF). Nature. 444 (7119): 587–91. Bibcode:2006Natur.444..587F . doi:10.1038/nature05357 . PMID 17136087 . Retrieved 20 May 2014. ^ Jump up to: a b c d e f g h i j k l m n o p q r s t u Freeth, Tony; Jones, Alexander (2012). “The Cosmos in the Antikythera Mechanism” . Institute for the Study of the Ancient World. Retrieved 19 May 2014. Jump up ^ Pinotsis, A. D. (30 August 2007). 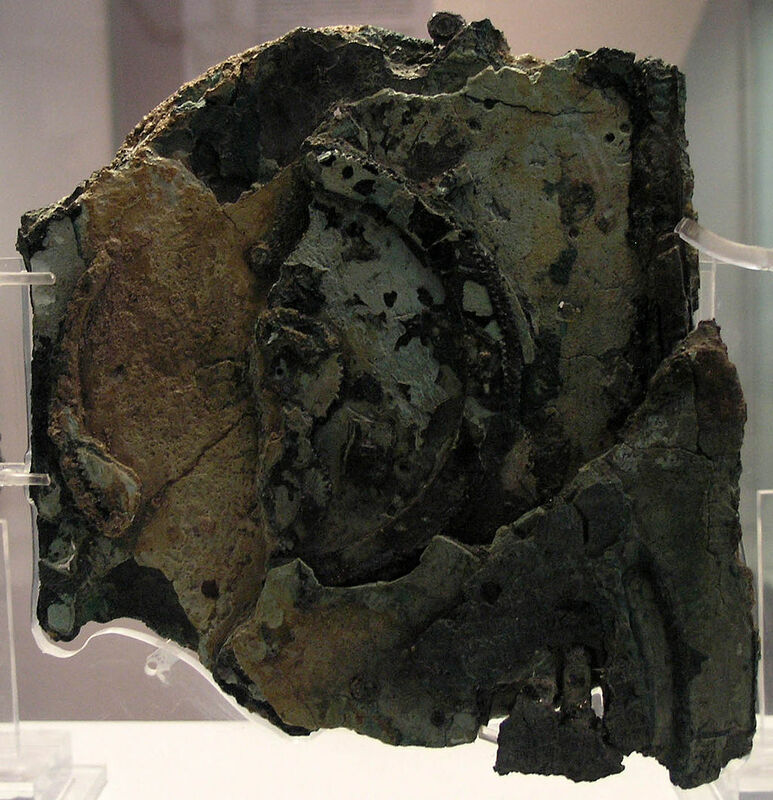 “The Antikythera mechanism: who was its creator and what was its use and purpose?” . Astronomical and Astrophysical Transactions. 26: 211–226. Bibcode:2007A&AT…26..211P . doi:10.1080/10556790601136925 . Retrieved 9 January 2015. ^ Jump up to: a b c d e f g h i j k l m n o p q r s Freeth, Tony; Jones, Alexander; Steele, John M.; Bitsakis, Yanis (31 July 2008). “Calendars with Olympiad display and eclipse prediction on the Antikythera Mechanism” (PDF). Nature. 454 (7204): 614–7. Bibcode:2008Natur.454..614F . doi:10.1038/nature07130 . PMID 18668103 . Retrieved 20 May 2014. Jump up ^ Kaplan, Sarah (14 June 2016). “The World’s Oldest Computer Is Still Revealing Its Secrets” , The Washington Post. Retrieved 16 June 2016. ^ Jump up to: a b Paul Iversen, “The Calendar on the Antikythera Mechanism and the Corinthian Family of Calendars, Hesperia 86 (2017): 130 and note 4.